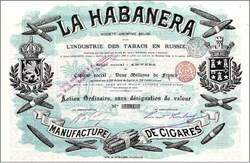 Beautifully engraved certificate from the La Habanera Anonyme Belge pour l'Industrie des Tabacs en Russie dated 1899. This historic document was printed by La Oote Libre and has pictures of cigars around its border. This item is hand signed by 2 of the Company's Administrators. There are 26 unused coupons attched to the certificate at the bottom.